Abstract: Primary care dentists are occasionally faced with conditions which cannot be managed in a primary care setting. 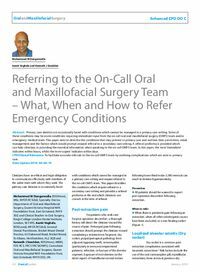 Some of these conditions may be acute conditions requiring immediate input from the on-call oral and maxillofacial surgery (OMFS) team and/or emergency medical team. This paper aims to describe the conditions that may present in primary care and outlines their prevention, initial management and the factors which would prompt onward referral to a secondary care setting. A referral proforma is provided which can help clinicians in providing the essential information when speaking to the on-call OMFS team. In this paper, the term ‘immediate’ indicates within hours, whilst the term ‘urgent’ indicates within days. Clinical relevance: To facilitate accurate referrals to the on-call OMFS team by outlining complications which are seen in primary care. Author notes: Mohammed M Dungarwalla, BDS(Hons), MSc, MFDS RCS(Ed), Specialty Doctor, Department of Oral and Maxillofacial Surgery, Queen Victoria Hospital NHS Foundation Trust, East Grinstead, RH19 3DZ and Clinical Teacher in Oral Surgery, King’s College London Dental Institute, London, SE5 9RS, Aamir Vaghela, BDS(Lond), MFDS RCS(Ed), General Dental Practitioner, Bricket Wood Dental Practice, 65 Oakwood Road, Bricket Wood, St Albans, Hertfordshire, AL2 3QB and Kenneth J Sneddon, BDS(Hons), MBBS, FDS RCS, FRCS FRCS(OMFS), Consultant Oral and Maxillofacial Surgeon, Queen Victoria Hospital NHS Foundation Trust, East Grinstead, RH19 3DZ, UK. Objective: To provide details of the management and onward referral for conditions which may be encountered in primary care.